Cruise—this is a cruise; that’s the commonly used word. I found it jarring on first encounter some years ago. It seemed to suggest a lubberly, all-you-can-eat jaunt to the Bahamas from Ft. Lauderdale aboard a blindingly white vessel the size of a horizontal Midtown Manhattan high rise, volleyball on the 0-12 deck, rum swizzles on the fantail at sunset (for a hilarious account of one such, try David Foster Wallace’s A Supposedly Fun Thing I’ll Never Do Again). I use it unthinkingly now, but “expedition” is a more indicative word. Not that we suffer squalor aboard research vessels or privation, except perhaps for the absence of rum swizzles. I’ve noticed a consistent rhythm to these cruises, almost like the traditional three-act dramatic structure. Flurries of activity take place during Act One, scientists scurrying to unpack and assemble their gear, in this case an elaborate process, given the biochemical research, while, as strangers, we meet and get to know one another. Friendships form and deepen more quickly at sea than ashore, partly because quarters are close and isolation complete, but also because a sort of expedition ethic obtains: be of good cheer even if you aren’t. Likewise, friendships are severed more abruptly, when the cruise is complete, though some of us will meet again to pick up where we left off, aboard other ships on other oceans. Seasickness lurks in the wings during Act One, shadowing the first timers, though that’s been no issue on this cruise. The 1,000-mile Bering Sea passage was serene, and we’ve been in ice since we cleared the strait, which is more like being aground than at sea. I’ve only now gotten used to the fact that I can safely place a cup of coffee on a flat surface and turn my back. Water sampling after a CTD cast. During Act Two, the bulk of the cruise, research/shipboard routine sets in. 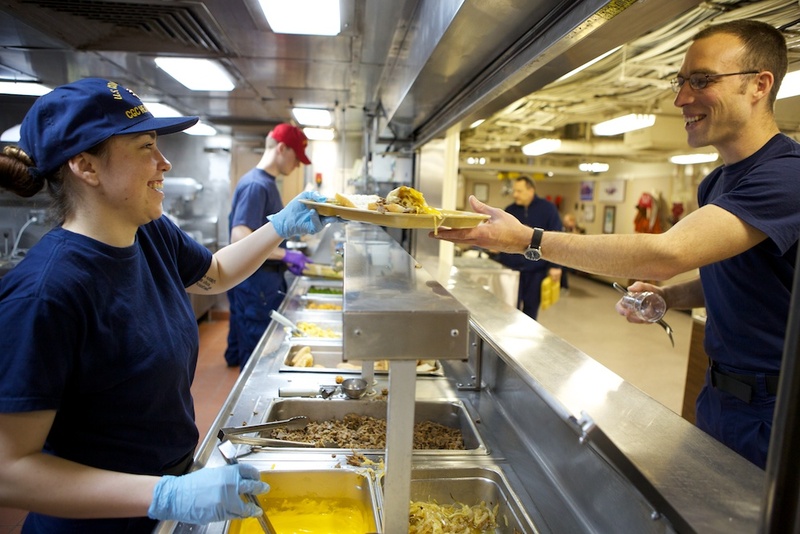 Newcomers have quickly learned shipboard ways and customs. 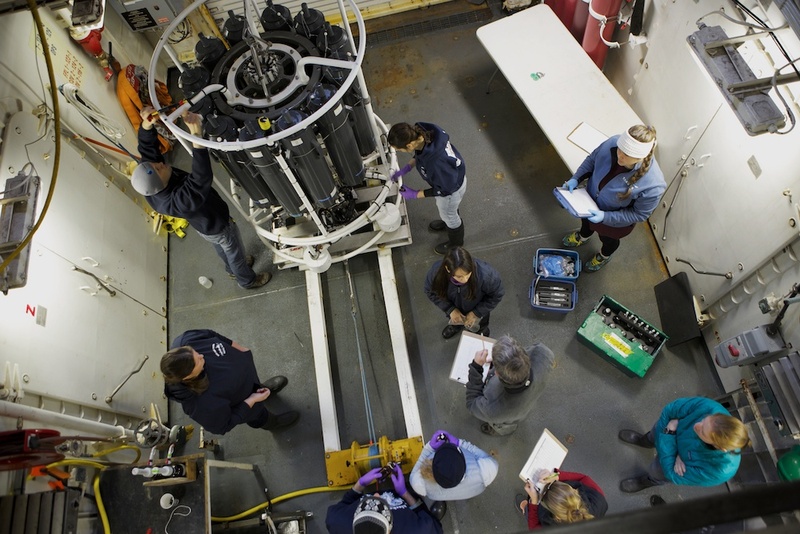 At this writing, the watch standers, on 12-hour shifts, have completed 162 CTD casts to measure ocean temperature and salinity, chlorophyll content via the fluorometer, and to obtain water samples for further biological analysis. The CTD watch standers, often on their first cruise, have, as we’ve noticed on other ships, melded into social units, based on crazy hours and shared experience, with a range of inside jokes and references. Also at this writing, we’re about to set up for the eleventh on-ice deployment. So Act Two continues apace, but its end draws near, and you hear begin to hear strains of Act Three. At lunch, people were talking about flight times and travel plans to Denali, Seward, and other Alaskan sites after the flight from Dutch to Anchorage. At last night’s science meeting, one of the topics was the means of shipping all this gear back home. The data-collection science will end on June 19, and Healy will point her bow south into open water. Then “Channel fever” will likely set in. However, for Healy’s crew all this act imagery is not applicable. While we’ve made new friends among the crew, and they’ve treated us with utmost kindness and cooperation, in the scheme of things, we’re another in a string of science parties. After they discharge us in Dutch, they’ll steam to Kodiak, a nice town for a three-day liberty, I hear, before they return to Dutch to pick up the next science party. So it goes with Healy. She’s solidly booked all summer, every summer, and because she’s the only American research vessel capable of working in Western Arctic ice, competition for slots aboard is intense. She won’t return to her homeport of Seattle until late September. Healy is unique in several respects. She’s not the only icebreaker in the Coast Guard fleet, but Polar Star and Polar Sea are devoted almost exclusively to servicing the American base at McMurdo, Antarctica. Healy is the only purpose-built ocean research vessel in the service. 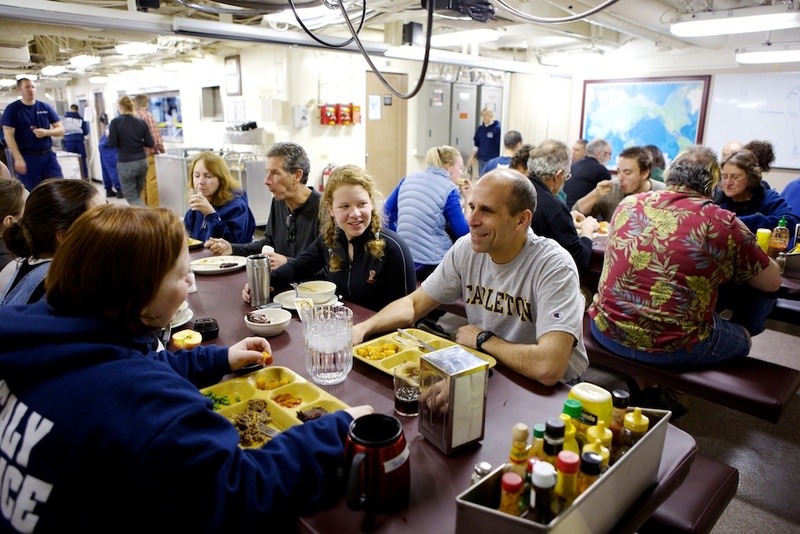 Most of the other U.S. flagged research vessels, including Knorr, Melville, Revelle, and Atlantis, while officially owned by the Navy, are manned and operated by universities or science institutions such as Scripps and Woods Hole Oceanographic Institution. Their upper-echelon personnel tend to be professional mariners with degrees from national Merchant Marine academies, who tend to remain aboard their respective ships throughout their careers. These vessels are exclusively in the business of ocean research. Healy is different. Research is her prime purpose, that is, she goes where the science projects, funded mainly by the National Science Foundation, require. But she is also a Coast Guard training platform. 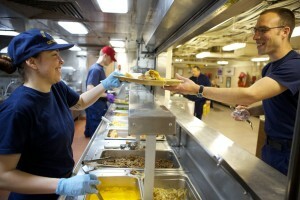 On any one “mission,” the Coast Guard’s version of “cruise,” half the crew are trainees, half returnees. Some of the crew come aboard straight out of high school via boot camp. No member of Healy’s complement, including the captain and the chief engineer, remains aboard throughout his or her career, few over three years running. Some people approve of this system, others not so much, but no matter—it’s fundamental to the Coast Guard concept. Four meals a day are served in the communal messroom. Healy is definitely a military ship. The crew wear functional uniforms and, when wearing hats, salute officers on the bridge. But not too fine a point is placed on military formalities. Everyone eats together in the same messroom, and officers wait in the cafeteria line along with everyone else in the crew and science party. However, when new recruits, especially if this is their first ship, are about to transfer to another, Executive Officer Stanclik warns them that all Coast Guard billets are not quite as militarily light handed as Healy. The so-called white ships, for instance, engaged in law enforcement, drug interdiction or other “statutory missions” are run according to the Federal Code, by the book, don’t mess around. Healy publicizes her mission; you can find her position and mission description on line. The White Ships don’t do outreach. Yesterday there was a distinct diversion from the act-two routine. Kevin’s students Caroline Ferguson and Erin Dillon, who are missing their Stanford University commencement to participate in the cruise, were treated to a surrogate ceremony on the helicopter pad astern, a first-ever event for this fine ship. Healy stopped all engines after sticking her bow into the breeze to afford the ladies a lee. Captain Reeves and Executive Officer Greg Stanclik officiating in their “service dress bravo” uniforms festooned with medals and ribbons, the crew at attention, Chukchi Sea ice glinting in the high sun, Kevin and the graduates begowned and wearing tasseled mortar boards, strains of “Pomp and Circumstances” in the air—it was a most impressive scene for a commencement ceremony. “The Coast Guard,” said Greg, “loves ceremonies.” And, we can’t help noticing, they’re very good at them. Terrific of them to have the ceremony aboard ship. Incredibly memorable for the graduates.